Brigham Young University (often referred to as BYU or, colloquially, The Y) is a private research university located in Provo, Utah, United States. It is owned and operated by The Church of Jesus Christ of Latter-day Saints (LDS Church), and, excluding online students, is the largest of any religious university and the third largest private university in the United States, with 29,672 on-campus students. Approximately 99 percent of the students are members of the LDS Church, and one-third of its US students are from Utah. BYU offers programs in liberal arts, engineering, agriculture, management, physical and mathematical sciences, nursing and law. 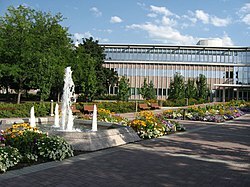 The university is broadly organized into 11 colleges or schools at its main Provo campus, with certain colleges and divisions defining their own admission standards. 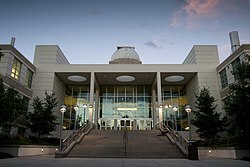 The university also administers two satellite campuses, one in Jerusalem and one in Salt Lake City, while its parent organization, the Church Educational System (CES), sponsors sister schools in Hawaii and Idaho. The university's primary focus is on undergraduate education, but it also has 68 master's and 25 doctoral degree programs. BYU's athletic teams compete in Division I of the NCAA and are collectively known as the BYU Cougars. Their college football team is an NCAA Division I Independent, while their other sports teams compete in either the West Coast Conference or Mountain Pacific Sports Federation. BYU's sports teams have won a total of fourteen national championships. Brigham Young University's origin can be traced back to 1862 when a man named Warren Dusenberry started a Provo school in a prominent adobe building called Cluff Hall, which was located in the northeast corner of 200 East and 200 North. 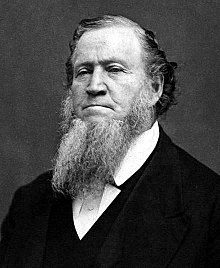 On October 16, 1875, Brigham Young, then president of the LDS Church, personally purchased the Lewis Building after previously hinting that a school would be built in Draper, Utah, in 1867. Hence, October 16, 1875, is commonly held as BYU's founding date. Said Young about his vision: "I hope to see an Academy established in Provo... at which the children of the Latter-day Saints can receive a good education unmixed with the pernicious atheistic influences that are found in so many of the higher schools of the country." What are the academic rankings for Brigham Young University-Provo? 1. number 72 for Academics. 2. number 27 for ROI (Return on Investment). What universities are similar to Brigham Young University-Provo?